McKenna Museums and McKenna Publishing/The New Orleans Tribune have been busy over the last few weeks, with members of their staffs taking part in a panel discussions on the Black press at a 300 Years in Black symposium presented by McKenna Museums on Feb. 22, and Tribune executive editor and publisher Beverly McKenna traveling to Grambling State University in early March to share with mass communication students at GSU her experiences as a newspaper publisher. The symposium, moderated by McKenna Museums curator Kim Coleman, featured Beverly McKenna, New Orleans Tribune managing editor Anitra Brown and Mark Charles Roudane, great-great-grandson of Dr. Louis Charles Roudanez, publisher of the historic New Orleans Tribune and L’Union. In addition to a number of locals, the panel discussion titled “Shaping the Narrative: The Importance of the Black Press”, was also attended by dozens of Black high school students from North Carolina visiting New Orleans. While at GSU, McKenna, who is also co-founder of McKenna Museums—which include Le Musée de f.p.c. 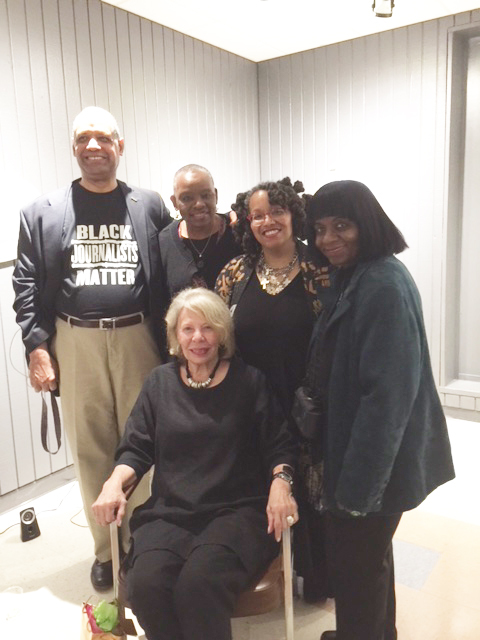 and the George & Leah McKenna Museum of African-American Art—also took part in a special reception and presentation on the importance of art collecting in the African-American community at the Dunbar Gallery and the Department of Visual and Performing Arts at Grambling State University. 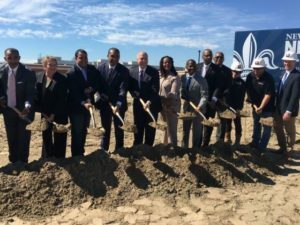 On March 9, Mayor Mitch Landrieu, city officials and community leaders broke ground on the 28-bed expansion of the Youth Study Center (YSC) at 1100 Milton Street. The $14.8 million, 22,000-square foot expansion will allow for increased services to accommodate juvenile offenders being housed at the Orleans Justice Center. Expected to be completed January 2019, this YSC expansion will also include a new, secondary/waiting area with group and individual visitation areas; high-school education area with space for classroom instruction, job training, arts, reading rooms and individuals instructions areas; a teachers’ lounge and common area; new outdoor circulation and recreation space; and food serving and seating area adjacent to the existing kitchen to expand existing food services. Along with these additions, the new structure will be designed to accommodate an additional floor in the future, if needed. Opened April 2014, the 48-bed, $31.6 million Youth Study Center serves as the City’s holding facility for pre-adjudicated youth and is designed to provide all staff, visitors and detained youth with a safe environment that prioritizes the particular needs of youth. The facility includes individual rooms for sleeping, new security system, access to classroom-based education, access to recreation and family visits, and access to quality medical care, including mental health and other wrap-around services to put our justice-involved youth back on a pathway to prosperity. Neighbors are also excited about the expansion and what it means for juvenile justice in the city. “The Juvenile Justice Complex was a wonderful opportunity for our community to embrace a single facility that provided wrap-around services, and addressed every area of the needs of youth and families, says Rev. Lionel Davis of the Pilotland Neighborhood Association. “This holistic approach puts every help option in one site. It brought resources to the youth for better results. The one-stop idea keeps our troubled young people out of otherwise adult facilities and gives families an opportunity to be a part of their loved one’s success story. This extension will connect reality to resources for positive results”. Funding for the project comes from the Federal Emergency Management Agency (FEMA) recovery dollars and City bonds. Take ‘Em Down NOLA, the coalition of community organizations and leaders that rallied around the removal of Confederate-era monuments in New Orleans will hold a first-of-its-kind summit designed to commemorate, celebrate and strategically align efforts to remove statues and monuments that are symbols of White supremacy. The conference will take place March 23-25 on the campus Southern University at New Orleans and will feature a kickoff event, plenary sessions, panels and workshops, keynote speakers, and a final protest action to promote a new ordinance to remove all symbols to White supremacy in the city of New Orleans. Attendees will be invited to put their shared knowledge and experience to use, to leave the meeting room and hit the streets together for a daytime action. Take ‘Em Down NOLA spent two years organizing, building on efforts that began nearly four decades earlier, to successfully force the city government to take down four White supremacist monuments in New Orleans. The New Orleans City Council voted in December 2015 to remove four statues, but more than a year would pass before the statues of Robert E. Lee, P.G.T. Beauregard and Jefferson Davis along with the Battle of Liberty Place Monument would be razed from their pedestals. The statue of Lee, the last of the four to come down, was removed on May 19, 2017. Since then, White supremacist monuments have fallen in several cities around the southern United States. Organizers from around the country and the world who have been engaged in Take ‘Em Down movements in their respective communities are expected to attend the summit. The featured keynote speakers will include Malcolm Suber, Angela Kinlaw, Michael Moore, Clyde Robertson and others. To RSVP for the Take ‘Em Down Summit: Lessons Learned and Challenges Ahead, email: info@takeemdownnola.org. The American Heart Association, the world’s leading voluntary health organization dedicated to building healthier lives, free of cardiovascular diseases and stroke, is awarding financial scholarships to six students who are working to improve the health and well-being of their community or college campus. Ahmed Arasah is one of six students who will receive a $1,500 scholarship. Arasah aspires to become a physician and promote healthy living through community yoga instruction and will offer sessions to his classmates at Xavier University in New Orleans this spring. Through the EmPOWERED To Serve Scholars competition, which launched in January in recognition of Martin Luther King, Jr. Day and the National Day of Service, the Association sought high school seniors and undergraduate college and university students who are actively striving to identify solutions to address the social determinants of health—the economic and social conditions in which people are born, grow, work and live—and how they impact risks for heart disease, stroke, and high blood pressure. The scholarship competition is part of the Association’s Take Me Home video docuseries campaign, which leverages the collective stories of our ambassadors, alliances, and communities as catalysts to rally, inspire and springboard improved health outcomes. In addition to receiving the scholarship, Arasah will have an opportunity to serve as an EmPOWERED To Serve ambassador and participate in 2018 social media campaigns. To view the students’ winning video submissions and learn more about these future change-agents, as well as EmPOWERED To Serve, visit empoweredtoserve.org.